OK, it’s an initiative of Volkswagen, but this still makes me smile. Making people do things they don’t really want to do by making them fun, what’s not to like? The Speed Camera lottery is a particular favourite…. 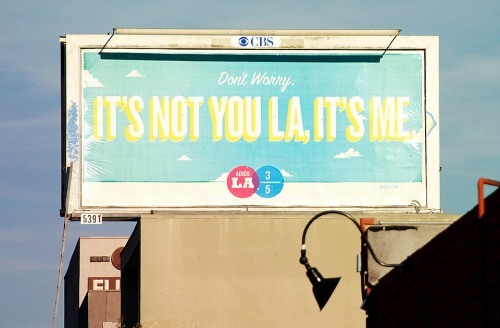 When artist Jon Jackson, a longtime Los Angeles resident, made plans to relocate to Noo Yoik, he didn’t want “to string LA along” and so “decided to firmly break it off through a graphic billboard series posted on the famous streets of his first love”! 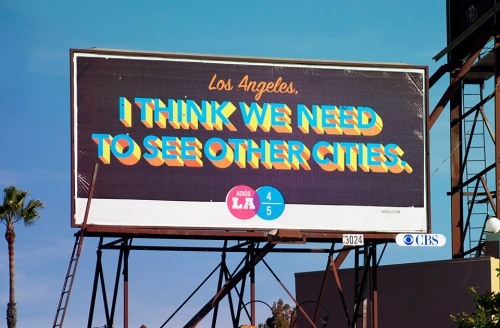 Needless to say, the City of the Angels hasn’t seen anything quite like Johnson’s series since Elektra Records broke the mainstream hold on LA’s billboards with their revolutionary paste-ups for The Doors’ debut album and Love’s “Forever Changes” set in 1966-67. You can check out Jackson’s full series here.